Your onsite clinical research team has one main job — caring for patients. The TrialMaster Electronic Data Capture (EDC) solution makes it easier for doctors, nurses and other medical professionals to enter and manage their clinical trial data, thereby freeing up the maximum amount of time to care for patients. This ease of use for investigative sites, coupled with state-of-the-art risk-based monitoring (RBM) and analytical tools, means that life science companies can shorten the time to market for essential life-saving treatments. Mobile devices and patient-reported data have changed how your team collects data during clinical trials. TrialMaster provides easy access for site researchers and sponsor staff, whether they are using desktops, laptops, tablets or smartphones. All screens adapt in real time to the size of the device on which TrialMaster is running, so a single set of study design information produces layouts that appear to be custom-designed to the user’s device. Additionally, TrialMaster’s built-in ePRO (electronic patient-reported outcomes) captures data directly from patients, and the translation capability allows all users to work in their preferred language. Navigation is easy. TrialMaster guides site users through simple — easy-to-follow — data entry, which improves both speed and accuracy. Intuitive icons and helpful hyperlinks lead TrialMaster users through the process of filtering data based on form, visits, patients and query status. All forms of data may be handled, including batch-loaded lab data, data from external systems, imaging data and data entered directly by patients. TrialMaster supports flexible query management, sophisticated operational and clinical reporting, and provides the industry’s most capable facilities for data export. This can amount to significant savings across a clinical organization and better trial oversight and study delivery, which ultimately connect patients to better healthcare. Drives cleaner data with real-time data validation and dynamic eCRFs. Reduces the time researchers and data managers spend on query management, leaving more time for data analysis. Provides insights across the trial with personalized homepages. With a simple-to-use, drag-and-drop user interface, TrialMaster EDC streamlines and shortens study-build timelines. Additionally, TrialMaster offers reusable libraries and templates that enforce standards across studies. Whether building a simple Phase I trial or a complex oncology trial with multiple cycles, TrialMaster’s multi-window interface and sophisticated edit check engine provide a highly productive environment for your study build team. Establishes corporate standards for CDISC, CDASH at study build. Standardizes datasets across studies and therapeutic areas. Facilitates data exchange with multiple partners. Offers automated safety reporting by mapping collected data to standard E2B elements. Reduces time and costs related to the creation of SDTM datasets. Dynamic Monitoring - Allows automated selection of forms for source data verification (SDV), based on site risk ratings and actual collected data, such as if a patient experiences a Serious Adverse Event. Central Source Review - Enables central review and/or SDV of a scanned, auto-redacted copy of selected patient source documents, which reduces SDV overhead and time. Centralized Monitoring - Reports highlight questionable data and high-risk sites using a robust reporting solution, advanced key risk indicator reports and reliable issue detection. Facilitates different monitoring plans at diverse sites concurrently. 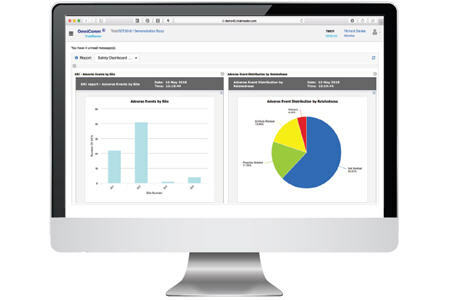 Integration with Acuity for additional RBM features, as well as advanced data visualizations.